Occupying nearly three floors and 40,000 square feet within the Venetian hotel, Tao Las Vegas supersedes the scale of the first Tao, its New York counterpart, also designed by Studio GAIA. The three-level space is located within the main shops of the Venetian. Two glowing, red thresholds indicate to visitors that while the interior is adorned with Buddhist statues, this restaurant is a thoroughly modern interpretation of Southeast Asian décor. 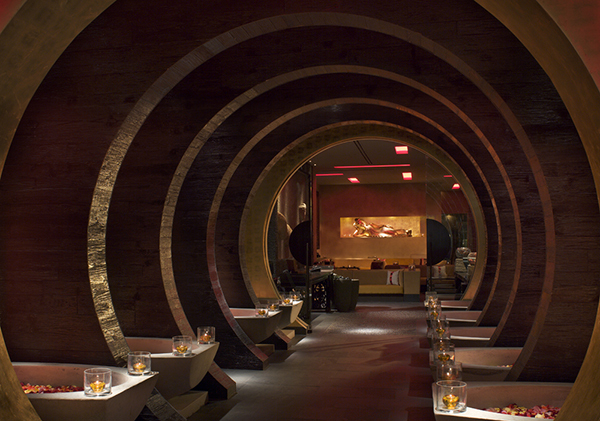 Upon entering, circular, Chinese-inspired portals invite guests inside into the 400-seat, double-height dining room. With a second level mezzanine which looks down upon the dining space, and a third-level club that looks down onto both, the new restaurant and night club brings the theatrics to a new level.